Offered by Wildwood Adventures. Species seen nowhere else in the world, dramatic basalt lava flows nearly a mile deep and some of the world’s most beautiful waterfalls are a few of the sights that await you on this tour. Come experience the grandeur of the Columbia River Gorge, one of the United States’ most photographed Natural Scenic Reserves. This tour will drive along the oldest scenic highway in the U.S., stopping at sweeping viewpoints, flowing falls, a historic lodge and the famed Bonneville Dam Sturgeon viewing center. This is a half day tour, typically offered from 9 a.m.-1 p.m. or 2-6 p.m. Please note, the tour route and sights may vary depending on the time of year and weather conditions. It is always Wildwood's goal to provide you with the most interesting adventure possible. Departing downtown Portland, you’ll head east along the Columbia River towards the quaint town of Troutdale, known as the Gateway to the Gorge. You will join the beautiful Historic Columbia River Highway, the first planned scenic roadway in the United States, and wind your way along the Sandy River to the first stop for the day: Crown Point. This famous overlook sits 733 feet above the Columbia River, atop the remains of a lava flow that swept through the Gorge around 14 to 17 million years ago. There, you will find 180-degree amazing views of the Columbia River Gorge and have time to explore the Vista House. This intricately designed observatory and museum is listed on the National Register of Historic Places. From there, you will again join the historic highway and travel deeper into the Columbia River National Scenic Area. The first waterfall for the day will be the dramatic Latourell Falls, which plunges 249 feet over a massive wall of columnar basalt. Depending on the season, a short .25 mile paved trail hike will be led to get a closer view of the falls. 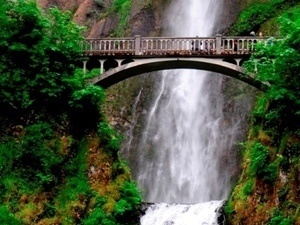 The grand Multnomah Falls will be the next stop in your journey. Plummeting 620 feet in two major steps, Multnomah Falls is the highest waterfall in Oregon and second highest in the nation! There, you will explore the Multnomah Falls Historic Lodge (a Cascadian style stone and timber lodge built in 1925) as well as the beautiful Multnomah Falls itself. During the gorge fire of 2017, the wildland fire crew fought tirelessly and ultimately saved this historic landmark. The easily accessible viewing platform offers a full view of the Benson Bridge and cascading falls beyond it. Onward to Bonneville Fish Hatchery. There, you will spend about 20 minutes on a short walking tour of this impressive fish hatchery (the largest in Oregon) and sturgeon viewing center! At the viewing center we will visit local celebrity: Herman the sturgeon. Herman is over 70 years old, 10-feet long and 450 pounds! Your journey will return you to Portland via the Columbia River scenic route (approximately 45 mins).